Anticipation for Saturday’s Red-White Spring Game was at an all-time high as evidenced by the record attendance of 86,818. Fans flocked in droves to see the big-name additions, the new systems on both sides of the ball and even Coach Scott Frost himself. Some of the highly-touted newcomers, namely Adrian Martinez and Greg Bell, did not disappoint while a few redshirt freshmen who didn’t play in last year’s scrimmage like Jaevon McQuitty and Austin Allen made their mark as well. However, a big part of the spring game is the opportunity for players further down the depth chart to see the field and to show the fans what they’re capable of. Saturday is a day for the walk-ons too. Wyatt Mazour, the junior out of Boone Central-Newman Grove, tore it up for the second straight year, finishing with four carries for 52 yards and a touchdown for the Red team. Mazour showed off his speed with the longest run of the day, a 43-yard sprint to the end zone in the third quarter. Kade Warner, the son of long-time NFL quarterback Kurt Warner, broke his hand in preseason practice last year and sat out the season as a redshirt. Warner was an incredibly productive wide receiver in high school and showed off why on Saturday, taking a screen pass from Tristan Gebbia, avoiding a tackle near the line of scrimmage and sprinting up the left sideline for a 57-yard touchdown, the longest play from scrimmage of the day. Austin Rose, the senior power back out of Lincoln North Star who has impressed in spring ball and fall camp throughout his career, only got two carries but did more with them than anybody else on the White team, rushing for 4 yards on one and 19 on the other. Senior Bryan Reimers (Lincoln East) caught one pass for 26 yards but also was involved in a lot of the big gains by his teammates on the Red team as he made a number of key blocks downfield. The most productive receiver in terms of catches on Saturday was redshirt sophomore Todd Honas, a product of Aurora High School. Honas caught six passes on seven targets for 46 yards for the White team. However, he also eliminated himself from the quarterback competition with an interception on a broken trick play. Allen caught three passes for 43 yards himself, and he credited Honas for helping him get through his first year of college while he redshirted. 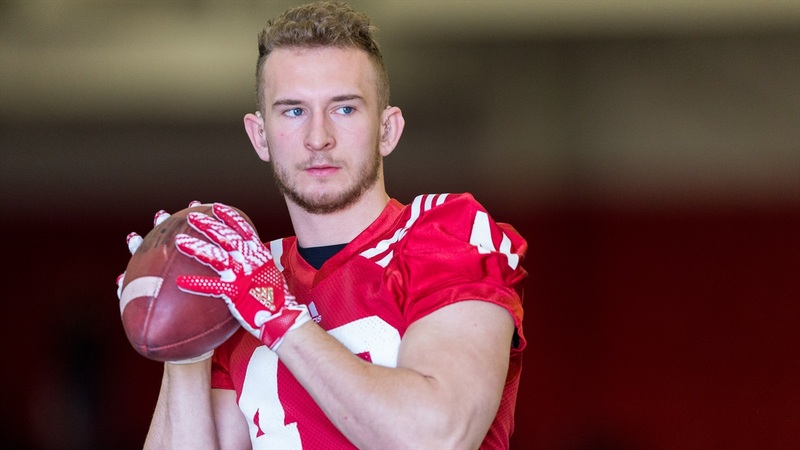 Honas is consistently one of the last players to leave the practice field as he and Christian Banker, a walk-on receiver from Omaha Skutt who redshirted last season, take turns on the jugs machine while most of the other players and coaches make their way to the locker room or stop for interviews with the media. Two years of hard work paid off for Honas on Saturday with 86,000 fans plus the town of Aurora watching. That is what the spring game at Nebraska is about as much as or more than anything else.